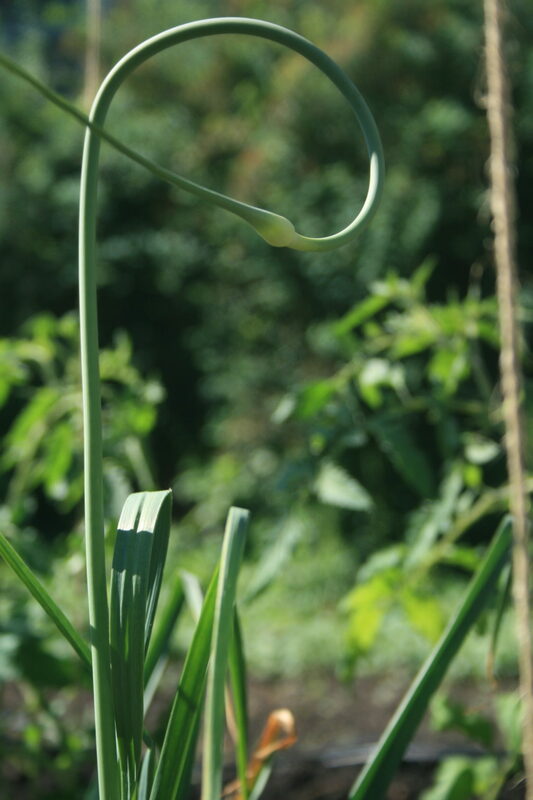 Garlic scapes are the elegant, crowning jewel on the head of the garlic plant in the month of June. Well, for a week, that is. 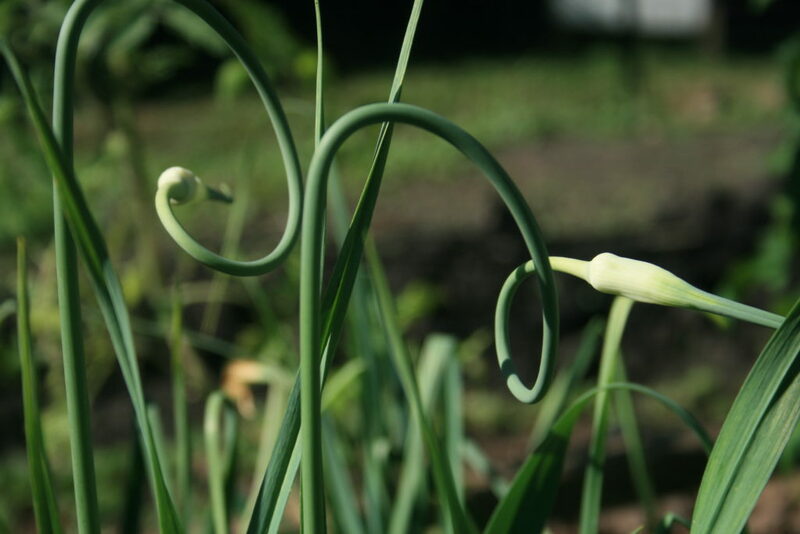 Harvest your scapes just as they begin to curl in order to conduct the plant’s energy to growing the bulb in the ground, rather than the seed head. You can snap the scape as close to the leaves as you like, though the further down you go, it will likely be less tender. The entire stalk is edible – the woodier pieces can be cooked or made into pesto. The tender stem and flower have a myriad of uses in your kitchen. 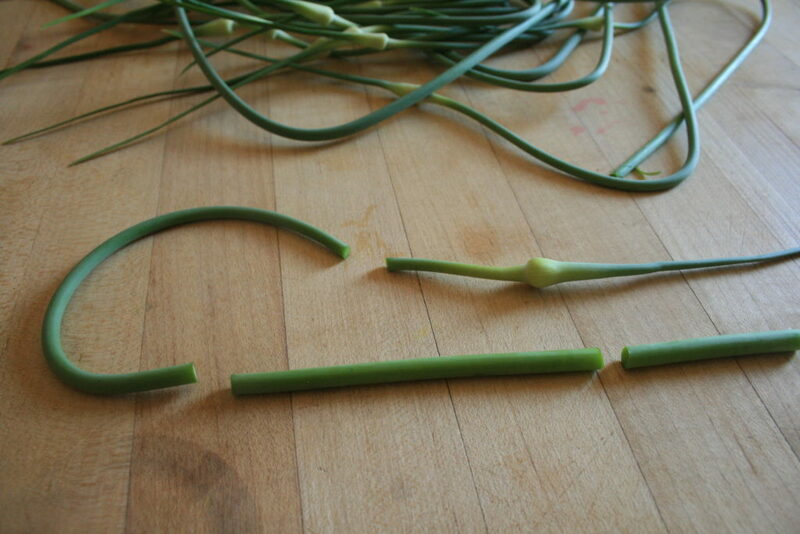 In past years, I have sliced my scapes up raw on salads and eggs. 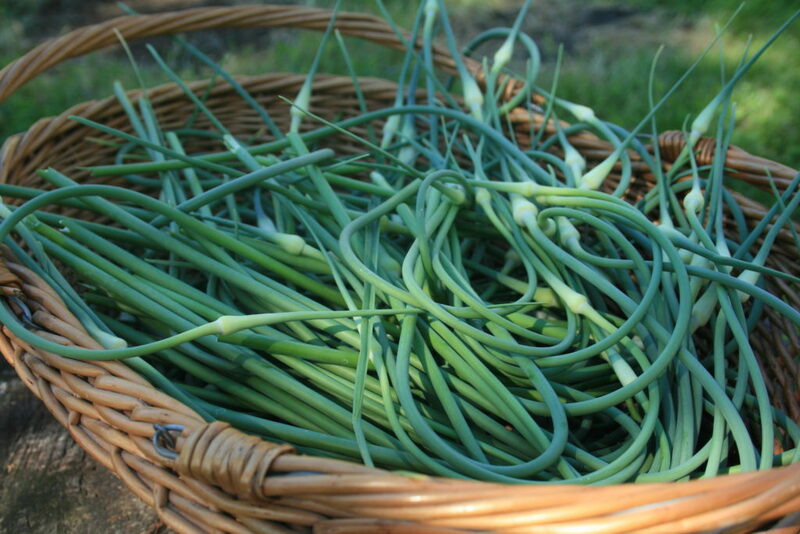 This year, with two pounds of scapes in my basket, it was time for a change of pace – pickled garlic scapes! 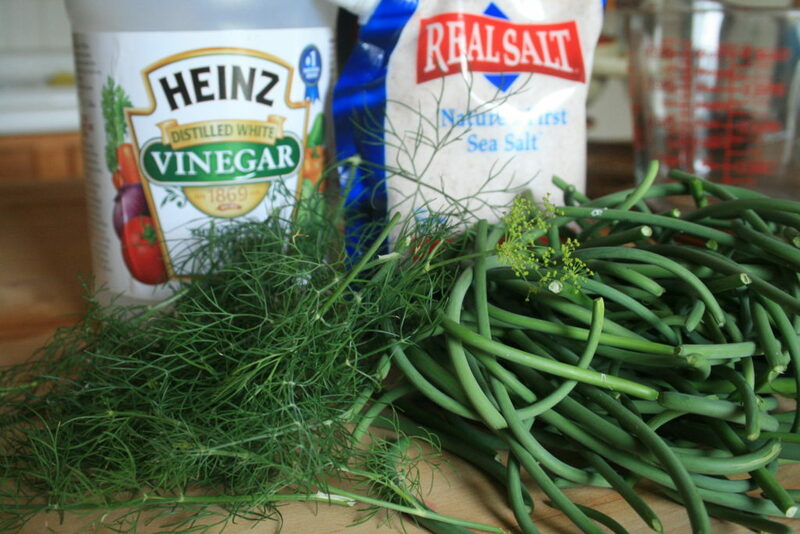 I wanted to try a couple different garlic scape recipes. To prepare them, I chopped off any woody part to set aside for cooking. I also chopped off the flower bulbs to try Nourished Kitchen’s lacto-fermented pickling recipe. I set out to do a standard pickling process with the remainder of the stem. Another cut separated the straight stem from the curly stem to make packing them in jars a little easier. 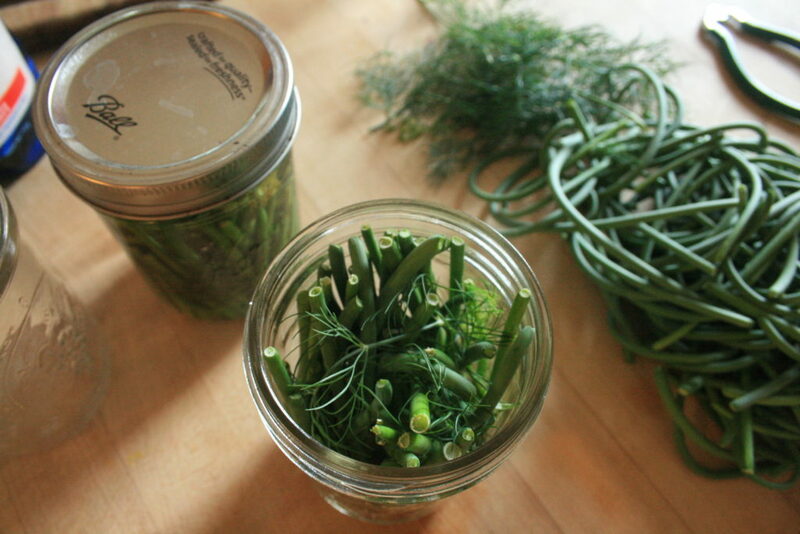 Pickling is a great way to get started with canning. In a nutshell, you slice and dice your produce how you like, stuff it in a piping hot jar, cover it with boiled vinegar, lid it and boil the jar for just 10 minutes! I didn’t get fancy with added spices. These would likely be beautifully delicious with a cayenne pepper thrown in, but with a hot-pepper-averse five year old in the house, I opted for fresh dill. Plain, simple, lovely. Pour a ratio of 2:1 vinegar to water into a pan and bring it to a boil. For every cup of vinegar you used, add a teaspoon of salt to the pan, too. 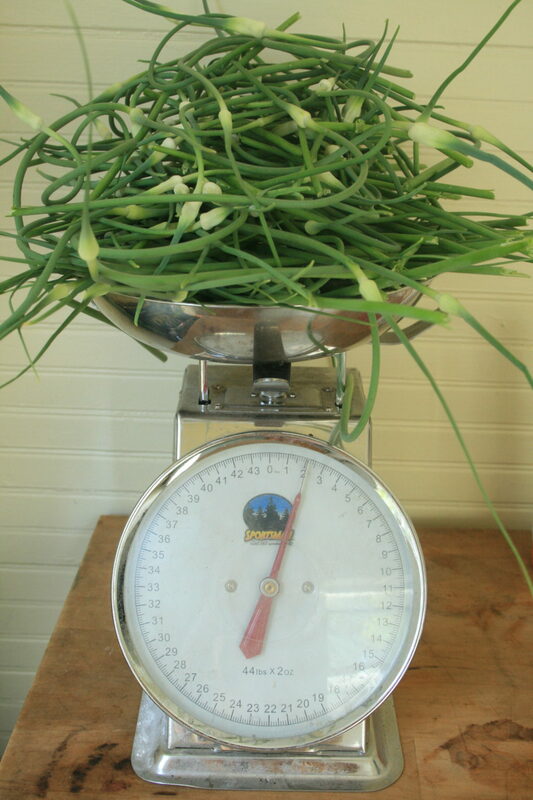 I don’t give a straight-up measurement because the amount of brine you need really varies, depending on how tight you pack your jars, and how many scapes you are processing. Bring your jars and lids to a boil to sterilize them. After ten minutes in a rolling boil, your jars are ready to be packed. 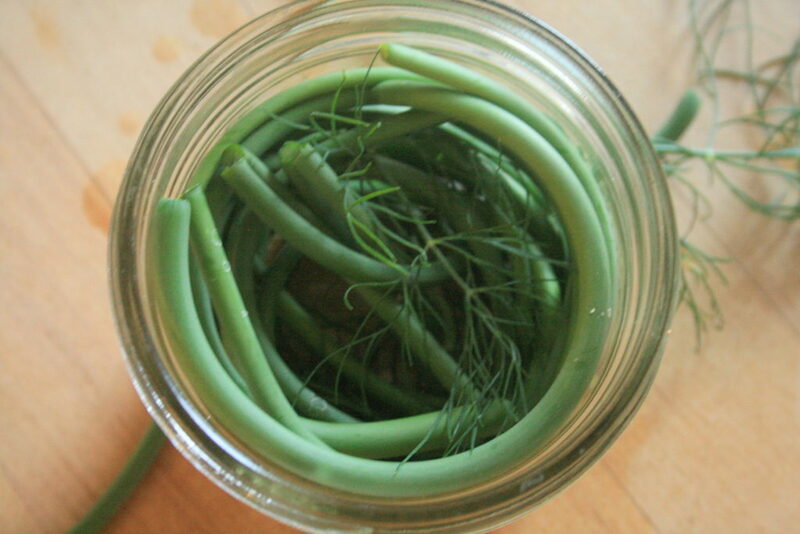 Take a jar out of the hot water, pack it with scapes and dill, top it with your boiled vinegar mixture, place the lid on with a slight twist, and place it back in the hot water bath. Then, just bring the jars to a boil for ten minutes. That’s it! 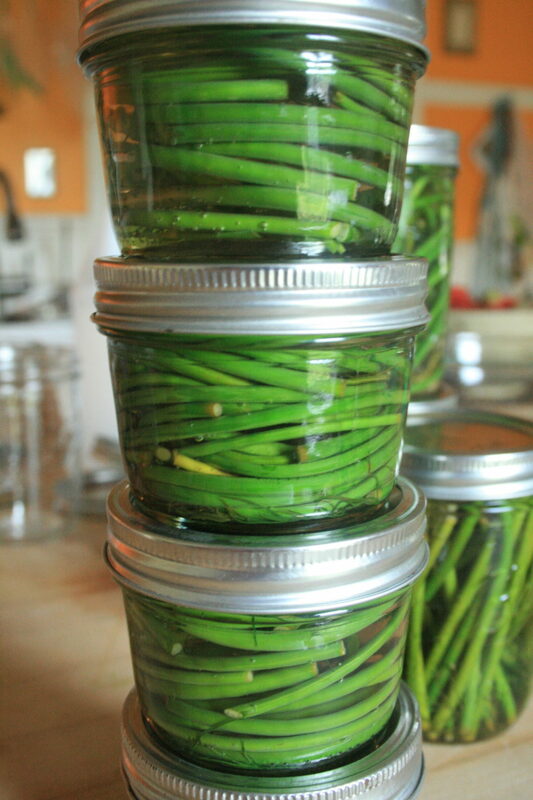 I found packing the scapes in a wide mouth canning jar was a tad tricky as they wanted to pop back out. For straighter pieces, I stood them up in a pint-sized jar. For curlier pieces, I curled and tucked them into half-pint jars. Next time I would try a standard mouth jar to help keep them packed down into the vinegar. Looking forward to this taste of summer in the dead of winter… if they last that long!